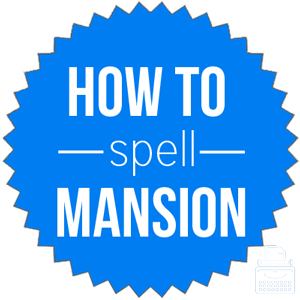 Spelling of Mansion: Mansion is spelled m-a-n-s-i-o-n. Definition of Mansion: A mansion is a large, stately house; a manor house. A mansion is typically owned by a wealthy person as such large dwellings are costly. Hugh Hefner is the owner of what is likely one of the most famous mansions in the world. Though it is rarely used and not well known, mansion is also used in Oriental and Medieval astronomy to refer to each or any one of the 28 divisions of the moon’s monthly path. Now obsolete, the word mansion used to simply mean an abode or dwelling place. Pronunciation of Mansion: Mansion is pronounced man–shun. What does mansion mean? Mansion is a noun. A mansion is a very large, impressive, expensive house or residence. Mansion is also another word for manor house, though it’s not common. Though he had more than enough wealth to purchase a huge mansion, he instead lived in a modest house in the countryside. Atop the mountain stood the mansion of the richest movie star. The word mansion was first used in the 14th century, according to Merriam-Webster’s. The word mansion comes from Late Middle English, mansioun, denoting the main residence of a lord, via Old French from the Latin word mansio(n-), meaning place where someone stays. The Latin word mansio-, comes from the verb manere, meaning to remain. In circa the mid-14th century, mansion meant chief residence of a lord, from Old French mansion, meaning stay, permanent abode, house, habitation, home; mansion, state, situation. In the 13th century, the Latin word mansionem – the past participle stem of manere, to stay, abide – meant a staying, a remaining, night quarters, station. The Greek word, menein, meant to remain, while the Persian word mandan meant the same. From sometime in the 1510s, the definition was a sense of any large and stately house. The word was also used in Middle English to mean a stop or stage of a journey; this is probably the origin of the astrological sense, temporary home. There are several other terms that can sometimes be used to replace mansion, though most of them cannot always used interchangeably. Mansion is a noun. A mansion is a large, impressive residence that is much bigger than the average house.